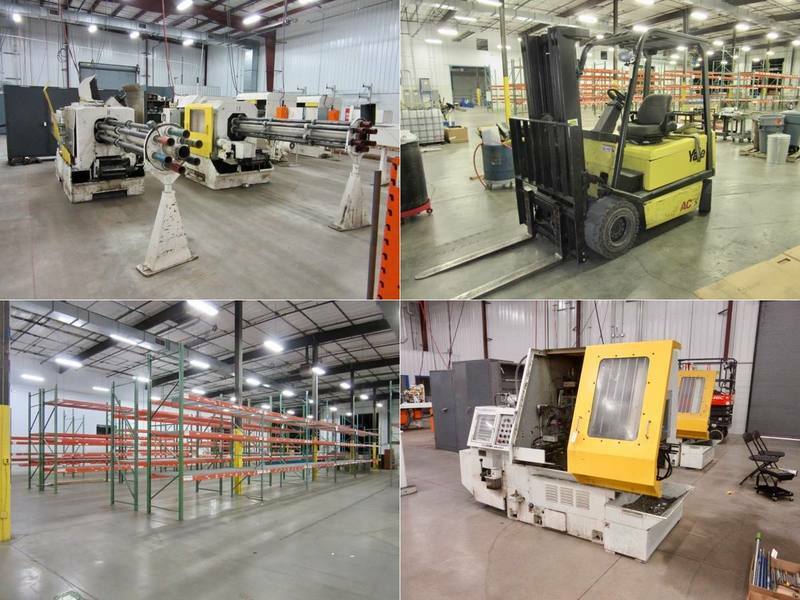 Machinery, Equipment, Forklifts, Pallet Racking, and More. Complete catalog with photos now available. NOTE END DATE CHANGE! Auction end date has been changed due to areas and roads affected by hurricane and inclement weather. Click on the Online Bidding Link above for complete catalog with photos. 3006. Cutting Tools, Collets, Etc. 3065. Wood Cabinet, Slotted, Includes Pipe Fittings, Valves, Etc. 3075. Assortment of Light Bulbs, Magnification Lamp, Etc. 3128. Broach Gauges, Depth Pins, Thread Gauges, Etc. 3155. Collets, Tool Holders, Etc. 3156. Grinding Discs, Sanding Belts, Brushes, Etc. 3163. Wrenches, Allen Wrenches, Extensions, Etc. 3164. Collets, Tool Holders, Etc. 3165. Holders, Drills, Collets, Etc. 3168. Holders, Drill Bits, Reamers, Etc. 3169. Cutters, Shavers, Bearings, Etc. 3171. Electrical Plugs, Switches, Etc. 3174. Flat Bars, Fasteners, Etc. 3177. Tool Holders, Clamps, Etc. 3182. Cutting Holders, Drill Bits, Etc. 3183. Reamers, Filter, Controls, Etc. 3184. Shavers, Bushings, Springs, Counter, Etc. 3185. Tool Holders and Parts. Sanding Disc. Fuses, Etc. 3187. Cutters, Reamers, Collets, Etc. 3201. Pushers, Brackets, Feed Rods, Etc. 3211. Thread Roll Heads, Etc. 3482. Cabinet, Brooms, Shovels, Rubber Mats, Mop Buckets, Rags, Etc. 3515. Selection of 40" x 42" Flat Cardboard for Shipping, Etc. 3575. Brooms, Shovel, Scraper, Etc. 3633. Tamp, Boot Brush, Shovels, Hoes, Brooms, Etc. 3666. Welding Screen, 64" x 46"
3706. Label Printers, Computer Connections, Etc. 3724. Selection of New Banker Boxes, File Folders, Etc. 3730. Selection of Office Items - Stamps, Fasteners, File Folders, Trash Cans, Etc. 3735. Framed White Board, 48" x 48"
3803. Contents of Room - Storage Cabinet, Foam Cups, Coffee Dispenser, Coffee Filters, Banker Boxes, Etc.